The LC100r is the ‘robot mode’ version of our LC100 print and apply systems. The LC100r is a highly advanced ‘print and peel’ system designed for challenging labeling requirements. High resolution (600 dots per inch) thermal transfer print quality combined with NSI’s retracting peel technology provides an excellent solution for any label application. 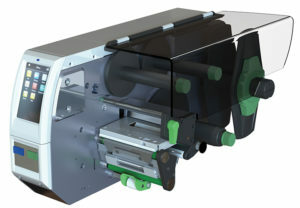 The LC100r is intended for applications that the customer will implement their own robotic pick and place system to interface with the precision ‘print and peel’ operations of the LC100r unit. The LC100r is ideal for small labels, high accuracy requirements, and high resolution printing requirements in various markets including Medical Device, Laboratory, Pharmaceutical, Automotive, Packaging, Electronics, and more.